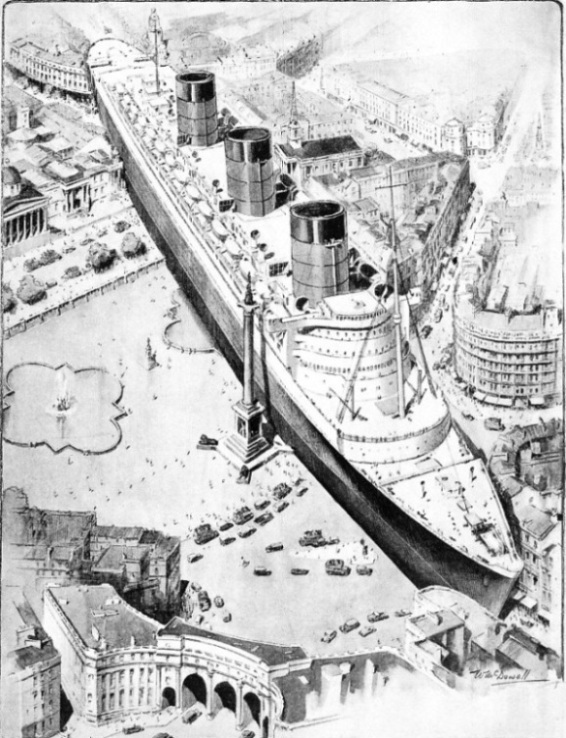 THE QUEEN MARY IN RELATION TO TRAFALGAR SQUARE, LONDON. The Nelson Monument (170 feet high) is shown on the starboard side, the crown of Nelson’s hat just overtopping the boat deck. The Queen Mary is 234 feet high from keel to masthead. Her stern, assuming it is possible to lay the ship down in this position, would push in the walls of the Garrick Theatre, in Charing Cross Road, and her stem would protrude into Whitehall. The Admiralty Arch is seen in the left foreground of this drawing. TO both expert and layman and to men of all ages and all climes the building of the giant Queen Mary must for ever remain not only a triumph of imagination and skill, but also a piece of magic. It was Samuel Cunard who originated the bold plan of connecting Britain, Canada, and the United States by regular mail and passenger steamship lines. Samuel Cunard was considered to be a madman, since all men of vision are inevitably regarded with suspicion and sometimes with contempt by the conventionally minded. Undaunted, Cunard built the Britannia -207 feet long, 740 horse-power - in 1840. 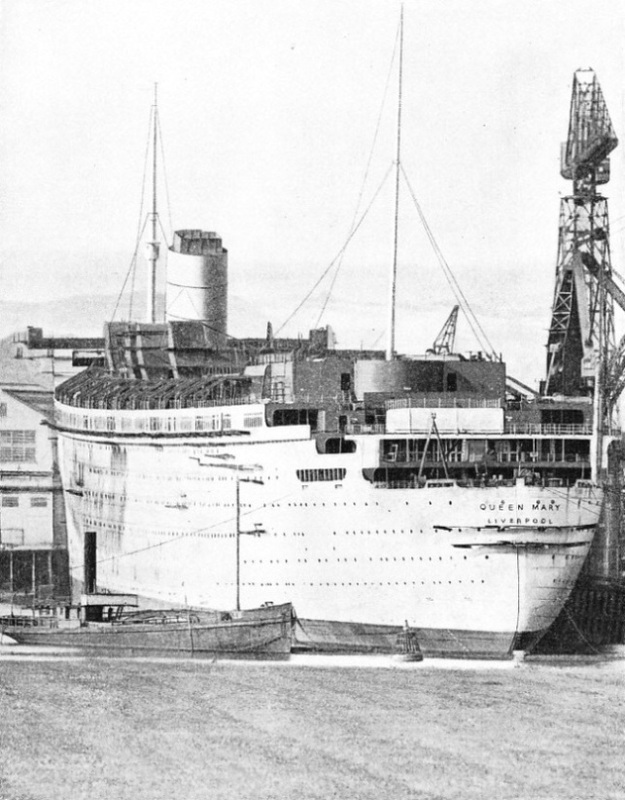 To-day, fewer than a hundred years later, the world is presented with an epic of human initiative and construction the Queen Mary, with an overall length of 1,018 feet, a beam of 118 feet, and a depth from keel to masthead of 234 feet; a ship that meant the employment of the brains and fingers of 300,000 workpeople, a ship that is the rightful Cunard descendant from the first germ that made transatlantic travel by steamship practicable. MODERNITY COMBINED WITH BEAUTY is the keynote of the Queen Mary, Great Britain’s contribution to the line of super-ships. The pride of her builders, she was the five hundred and thirty-fourth ship laid down in their yard - hence “No. 534”, by which designation she was known until her launch on September 26, 1934. The building of the Queen Mary is one of the greatest stories of human achievement. The building of any large ship is a complicated problem that has to be unravelled months, and sometimes years, before she can go down to the sea. In the early stages of design men experimented with tiny models of hull form, their researches being planned to test what would happen in all kinds of Atlantic conditions when applied to various forms of hull. For the Queen Mary over seven thousand experiments were carried out with many forms and shapes of models, which travelled a distance of 1,000 miles up and down the experimental tank until the final form was determined. From such small beginnings the Queen Mary was evolved, a ship of beautiful lines with a sloping stem, cruiser stern, and fore and aft rig, and with three raked funnels adding a final touch of dignity. The forward funnel is over 70 feet in height from the boat deck, the remaining two being set lower. The circumference of each funnel is nearly 100 feet, the larger diameter 30 feet. So large are the funnels that three big express locomotives could be run abreast through any one of them. Figures alone cannot convey to the mind the enormous size nor the majesty of this, the latest and most up-to-date of the world’s liners. World-famous structures drawn to scale, with the Queen Mary alongside or amid them, appear pygmy-like in comparison. Elucidating the size of this ship is in itself a difficult problem without bringing in the aid of known images for comparison. The illustration (shown above) has been prepared to give an adequate impression of the magnitude of man’s latest and boldest shipping achievement. The Nelson Column, Trafalgar Square, London (170 feet high), is shown on the starboard side, the crown of Nelson’s hat just overtopping the boat deck. Her stern, assuming it possible to lay the ship down in this position, would push in the walls of the Garrick Theatre in Charing Cross Road and her stem would protrude into Whitehall. ONE OF THE THREE GREAT FUNNELS in position. The forward funnel is over 70 feet in height from the boat deck. The remaining two have been set lower, but the circumference of each funnel is nearly 100 feet and the larger diameter 30 feet. So large are the funnels that three locomotives could be run abreast through any one of them. The illustration also shows a striking view of the vessel’s cruiser stern. If we consider the ship in relation to Westminster Abbey, the top of the Abbey towers would not reach to the top of her mainmast. The top of Magdalen Tower at Oxford (145 feet) would come half-way up to the middle funnel. The upraised hand of the statue of Liberty (151 feet from the top of the plinth), New York Harbour, would reach just above the bridge. These comparisons help us to gain some idea of the proportions of this remarkable vessel. Numbers, too, can in some ways stimulate our imagination. Official records show that ten million rivets, weighing 4,000 tons, have been driven into this ship; twenty-seven great boilers occupy five rooms, and over 2,600 feet of main steam piping lead from the boilers to the main and auxiliary machinery. The electric power supplied by seven turbo-generator sets, developing 10,000 kilowatts, is sufficient to supply lighting and public services for a town of the size of Brighton (population 147,427). Let us still play with the magic of figures. The structure comprises twelve decks, including the partial lower decks, which are discontinued across the extensive machinery spaces. The total weight of metal in the hull and machinery is more than 50,000 tons. About 2,000 portholes and windows are cut into the plates. Let us remember that these staggering figures go to make up but part of the Queen Mary, listed simply as No. 534. The extra-ordinary amount of preliminary theoretical work is one of the most notable features in designing super-ships. The structure is often called upon to meet stresses and strains of phenomenal force. When the Queen Mary pushes her thousand-odd feet of steel over the Atlantic Ocean she must at all times be ready to meet watery caverns a thousand feet wide, her whole structure poised here and there, or part buried in lashing seas. These conditions form the opposition which the vessel must be able to combat, for Nature is not always kind. So well have the plans been made for the meeting of this opposition that the Queen Mary is well prepared for storm as well as for calm. It is impossible in one chapter to deal fully with a ship of so many facets, a ship constructed as the peak of modern sea conquest. All that can be done at the moment is to present an introduction to the subject, leaving to later chapters the intimate details, which are no less important. MORE THAN 300,000 PEOPLE were employed in various capacities on the construction of “No. 534”. Ten million rivets were driven in. If forged into a chain they would reach from London to Newcastle, a distance of 268£ miles. The total weight of metal in the hull and machinery is more than 50,000 tons, while approximately 2,000 portholes and windows have been cut into the plates. The gigantic hull of the ship is divided by eighteen transverse, watertight bulkheads, while the double bottom, covering the whole of the vessel, contains seventy main compartments. We must also take account of an additional sub-division which is afforded by the inner skin of steel plating in the engine-room, and of the side oil bunkers in the boiler-rooms - these give a total number of 160 watertight compartments below the bulkhead deck. In other words, the ship has two bottoms - an inner and outer - with an intervening space of nearly 6 feet. This double bottom forms an inner and outer skin running the full length of the machinery spaces of the ship. The bulkhead forming the inner boundary of the bunker tanks throughout the boiler-room strengthens the vessel, and increases her resistance to longitudinal bending. Adequate resistance to all anticipated stresses that Nature may enforce is of primary importance in all shipbuilding. With the Queen Mary these stresses are multiplied in many ways, but a high factor of safety has been arrived at. Consider, for a moment, that she is a high-speed ship; and with high speed she must not sacrifice comfort, for Atlantic travel has long since been a problem of a combination of the two qualities. Her propelling equipment must provide a speed of as much as approximately 40 land miles an hour through all kinds of weather, a fairly consistent time schedule having to be kept on regular sailings. The propelling equipment is on four screws, and is of what is known as geared-turbine type. Each of the four propelling machinery groups can be operated independently. They consist of four turbines - one high-pressure, two intermediate-pressure and one low-pressure turbine and condenser. These are grouped round a main gear-wheel, each turbine driving a separate pinion, which engages with the main gear-wheel coupled to the forward end of the propeller shafting. Each of the four propellers is made of manganese bronze and is four-bladed, weighing roughly 35 tons apiece and worth about £7,000. The four main engines are contained in two engine-rooms, the forward engines for the two outer screws and the aft for the inner screws. There are twenty-seven boilers in five boiler rooms, with a working pressure of 400 lb per square inch and a steam temperature of 700 degrees Fahrenheit. A TWENTY-TWO-FEET MODEL of the Queen Mary. Over seven thousand tests were made by models in an experimental tank at the shipyard. In their journeys up and down the tank the models travelled a distance of about 1,000 miles. As a preliminary to the launching of the ship, models of launching machinery were made and a model was experimentally launched. Oil fuel for the furnaces of these boilers is carried in side bunkers to the boiler rooms, the capacity being about 6,300 tons. The air and overflow pipe system is so arranged that the escape of oil fuel vapour, with its distinctive odour, is not permitted in any part of the ship. Six filling stations, arranged at convenient positions, will allow of the vessel being fuelled in eight hours, no manual labour being required except for coupling up the hoses. The whole operation of bunkering (i.e. filling the bunkers) can be carried out without interfering in any way with other activities, such as taking in stores or embarking passengers. The horse-power to be developed is such that the vessel can maintain a fortnightly service between Southampton, Cherbourg and New York, allowing ample time in the terminal ports for fuelling, water storing and preparing passenger accommodation for the next journey. To enable an accurate time schedule to be adhered to, there is an ample margin of power, so that any intermediate delay caused by excessively bad weather can be made up when conditions permit. It is also possible for the ship to arrive in port, disembark her 2,000 or more passengers, refuel, embark new passengers and proceed on the next voyage within twelve hours. The Queen Mary is not only a wonder of mechanics and engineering; she is also a floating hotel, whose appointments must be equal to, or even superior to, those of the finest hotels ashore. She is, therefore, equipped with electrical installations of gigantic scale. Even apart from any provision made by means of electricity for the comfort of passengers, it would be difficult to conceive how a ship of this size could be efficiently handled and its internal organization controlled without the aid of electricity. Electrical power is so easily distributed to places remote from the source of supply. All the deck machinery, for example, such as steering gear, windlass, capstans, cargo-, baggage-, mail- and boat-winches, and the like are electrically operated. In the main engine-rooms and boiler-rooms all the auxiliary machinery, with one or two exceptions, is controlled by electrical power. ONE OF THE CHAINS attached to the two great anchors of the Queen Mary. Each chain is 990 feet (165 fathoms) long and weighs 145 tons. Each link has a diameter of 4⅛ in. Elaborate tests were made to ensure the strength of the chains. A three-links piece of chain was successfully subjected to a strain of nearly 700 tons. This exceeded the necessary requirements by over 400 tons. Separate links were bent double while cold and showed no sign of fracture. Luxury combined with dignity for all classes of passengers is the keynote of No. 534. Altogether she carries about 2,000 passengers and about 1,050 crew. The passenger groups are first class, tourist and third class, and for each class there is distinctive beauty of accommodation, to be found in no other ship. During the last few years space requirements for every class of transatlantic passenger have increased, a problem adequately solved by the successors of Samuel Cunard. Although the ship is essentially an express passenger carrier, her space allowance for state rooms and public rooms also is a more than remarkable feature. First-class accommodation is provided in state rooms on the sun deck, main deck, and “A” and “B” decks. The rooms are single-and two-berths cabins, most of them being on the outside and receiving natural light and ventilation. Suites on the main and “A” decks amidships comprise sitting-room, bedroom, servant’s room, box-room and private bathroom. All first-class state rooms are fitted with a special system of ventilation. Ducts provide separate supplies of warm and cold air, and the temperature of the air supplied to each room is easily controlled by the occupants. The promenade deck is given almost entirely to the social needs of first-class passengers. The main lounge has a dance floor, a stage, and a cinema projection room. Galleries fitted as writing-rooms or small salons lead to the main entrance, where shops are established. In a vessel of this size, dealing, as she does, with so big a staff and passenger complement, it is vital to remember that the luxury provided has to be designed on the most economic lines, for the saving of even one-quarter per cent on any trip must amount to a sum well worth considering. The main machinery of the vessel is entirely separate from the plant that deals with the “hotel” services. These services are worth noting. Figures again must come into our estimation of the Queen Mary. Over 30,000 lamps are needed for the ship’s accommodation, and most of these lamps are of high candle-power. Passenger lifts, numbering eleven, are of express type, and provide communication with eight levels, from the sports deck, squash court and gymnasium direct to the swimming and Turkish baths. Three lifts deal with stores, two with the handling of baggage, and two are for food services. On every voyage, according to the passenger complement, between 40,000 and 60,000 meals must be served. The question of temperature in relation to the meat, vegetable, fish and other provision chambers is of extreme importance, since all meals must be freshly cooked and served in a manner that would elicit the praise of a gourmet. The preparation and serving of food is by means of electrically-operated galleys and bakeries, pantries, dumbwaiters, and air-conditioning plant installed for the maintenance of a suitable atmosphere for the dining saloons. The telephone service is another important branch of electrical work, especially that concerning communication within the ship. She is so large that a comprehensive internal telephone system is obviously an essential. There are also a noiseless steward-call system for the use of passengers, automatic and manually-operated alarm systems and, naturally, a system of dial telegraph and signalling instruments for the communication of orders from the bridge. There are, in fact, about 2,000 miles of electric wiring fitted throughout the new liner. The radio installation of the ship is an extraordinary one. Two stations on board, separated by a distance of about 250 ft, permit of simultaneous transmission and reception without mutual interference, thus making it possible to carry on several different services at the same time. Such facilities are essential to a vessel of this size, as the volume of radio-telegraphic and radio-telephonic work must necessarily be heavy. The transmitting station is on the boat deck forward of the mainmast. There are four transmitters, each able to maintain continuous communication with both sides of the Atlantic. The receiving station is also on the boat deck, but between the first and second funnels, where the control of the whole radio equipment is centred. Within the receiving station are the eight operating positions, the radio-telephone exchange and the chief accepting office for passengers’ radio-telegrams. Typewriters and high-speed machines for the handling of messages are provided, and there are telephones for communication with the bridge and other important positions. Each of the telegraphists has in front of him a dial which is similar to the ordinary automatic telephone dial. By the manipulation of this dial the operator can start up or shut down a transmitter, increase or decrease its power as may be requisite, or change to any desired wave-length. Each operation takes but a few seconds and the operator is all the time informed, by a system of indicators, of the condition in which the transmitter is functioning. There is a duplicate system to meet the possibility of breakdown. Communications of a transatlantic express steamer call for the employment of many wave-lengths. The Queen Mary needs thirty or so, for short, medium and long wave and for radiotelephony. For the operation of these wave-lengths at least nine separate aerial systems are required, the main aerial having a 600-ft span. There are secrecy devices applied to the telephone system to ensure privacy to any user, no matter to what part of the world he may be speaking. Telephone calls can be made from special booths or from any one of the 500 state rooms. Radio broadcasting has made considerable strides during the past few years, and the builders of the Queen Mary have taken the fullest advantage of this. Provision is made for the simultaneous relaying of three programmes to the different public rooms. Thirty-eight loud-speakers are divided into eight groups. It is possible to relay orchestral music to which passengers in the first-class lounge may be listening, so that the music can be enjoyed also by those in the tourist lounge and in the third-class winter garden. At the same time dance music can be provided by gramophone records for passengers in the first-class tea and dance room, the veranda restaurant, and the “A” deck tourist lounge. The microphones can be connected by way of amplifiers to the ship’s radio telephone transmitter, so that a concert or speech given in the ship can be received and re-broadcast by any broadcasting organization in Britain and America or elsewhere. Thus the ship becomes a world-wide broadcasting station. When in port any of the ship’s programmes can be transmitted through the microphones to a telephone landline connexion and so to a BBC or other land station for re-transmitting. All the fixed loud-speakers are built into the panelling of the rooms and made to tone with the decorative scheme. A local volume control for each loud-speaker group enables the volume to be adjusted independently of the input panel volume controls in the control room, the arrangements throughout being such that the quality of the sound reproduction will always be of the highest possible standard. This, in conjunction with the alternative programme facilities, will ensure that the varying tastes and requirements of the passengers will be met in every way and at any time. We will now consider some of the problems that have to be faced in the building of a ship of the size of the Queen Mary. Reflect on the man who is guiding a machine that is cutting steel shavings from the 3-ft shaft which will form the driving centre of the lower-pressure turbine on one of the four propeller shafts. An error by this man would cost the builders about £15,000. Consider the two great anchors, each weighing sixteen tons. These are among the largest that have ever been made for an ocean liner, and they are recessed into the bows to obviate wind resistance. The anchor chains are of 165 fathoms (990 feet), weighing 145 tons. The testing of these chains was of considerable importance. A three-links piece of chain was subjected to a strain of nearly 700 tons - an excess of over 400 tons necessary for official requirements. Consider, too, the cable necessary to carry electric energy. There are 4,000 miles of such cable - a cable that would stretch from New York to San Francisco and 800 miles beyond. We have seen that many experiments were made with the hull. The three large funnels, too, were made to scale, and subjected to every kind of test with smoke - producing apparatus in a specially constructed wind tunnel. No smoke must be allowed to descend on to the promenade decks to interfere with the comfort of passengers. Thus it was necessary to conduct dozens of experiments before the final designs and heights could be finally approved. Funnels - it is well that the newest and greatest ship in the world should not do away with these symbols of conquest. In all ages nations have taken pride in their ships - first with sails and then with funnels; pride in little ships, as in the early days, with Drake’s Golden Hind of 100 tons burden, Nelson’s Victory of 2,162 tons, with Grenville’s Revenge of 500 tons, and then with Cunard and his Britannia. Small wonder that Great Britain - and it would seem the whole of the world - focuses attention on the miracle of No. 534, otherwise the Queen Mary. What a miracle she is - too vast for a single chapter, a ship for the admiration of all men, a ship evolved from the wooden paddle steamer. At her launch on September 26, 1934, the people of the British Empire were privileged to listen to the naming of the great vessel by Her Majesty the Queen. In striking contrast to the voice of Her Majesty, broadcast at the historic ceremony, there followed the mighty roar of falling wooden supports and crashing of drag-chains as the huge hull took to the water of the Clyde. In the naming of the ship a new fashion was set. 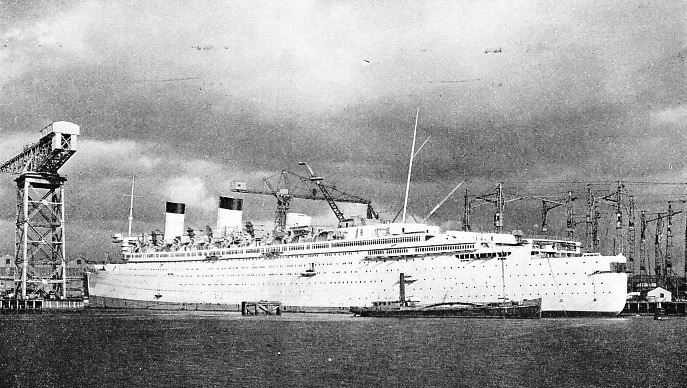 Formerly the names of Cunard liners had ended in -ia, e.g. Mauretania, and those of the White Star Line in -ic, e.g. Olympic. 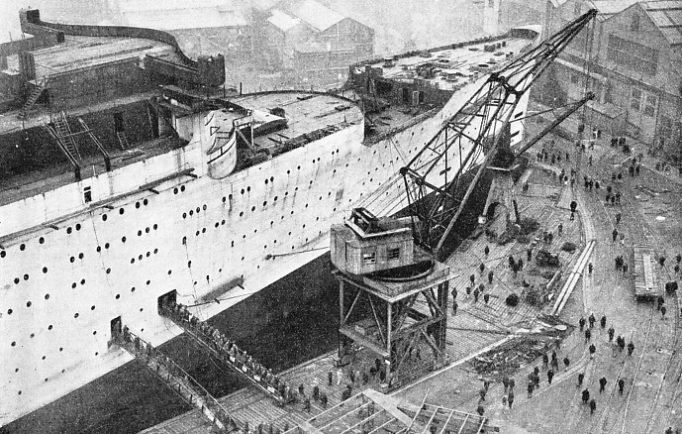 In yet another way did the launch of the Queen Mary make history, as she is the first giant vessel to be launched in the service of the combined Cunard and White Star Lines. She is, indeed, “the giant of the Seven Seas”. She represents the peak of human achievement in sea craft - a vessel of which the great sea-going nation, Britain, may be justifiably proud. You can read more on The Queen Mary’s Engines and Where the Queen Mary was Built on this website.